Description: The annual Halloween Harvest Festival at Pierce College begins a six-week run. The daytime activities are kid-friendly (including rides, animals, and a corn maze), but true-blood Halloween fans will be more interested in the scary night-time FrightFair Screampark, featuring a trio of terrifying walk-through attractions: The Factory of Nightmares Haunted House; the Creatures of the Corn Trail; and the Insane Reaction maze. The Halloween Harvest Festival runs every day of the week from September 26 through November 2. The FrightFair horrors manifest on these dates: September 26-29; October 3-5, 9-12, 15-19, 21-26,28-31; November 1-2. Hours for the Harvest Festival are 10am to 10pm Sunday through Thursday, and 10am to midnight on Fridays and Saturdays. Daytime activities such as the Corn Maze will be open everyday during festival hours. The spooky haunted attractions start at dusk and run till the festival closes each night. Festival Admission: $5.00 for adults and children (children under 3 years of age free). Additional activity tickets may be purchased, depending on how many rides you want to go on. 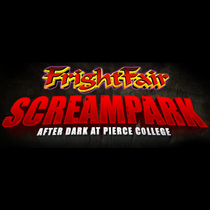 FrightFair Screampark has long been one of Hollywood Gothique's favorite Halloween events in Los Angeles. Check it out! Looking for more Halloween Haunts? Check out our pages for and Halloween Haunts: Mazes and Rides and Halloween Haunts for Children.